Almost everyone who wants to learn more about machine learning (ML) sooner or later follows one of the tutorials solving the MNIST classification problem. The MNIST data set contains a large number of handwritten (labeled) digits and the goal is to perform image recognition on those images to detect the actual digit. 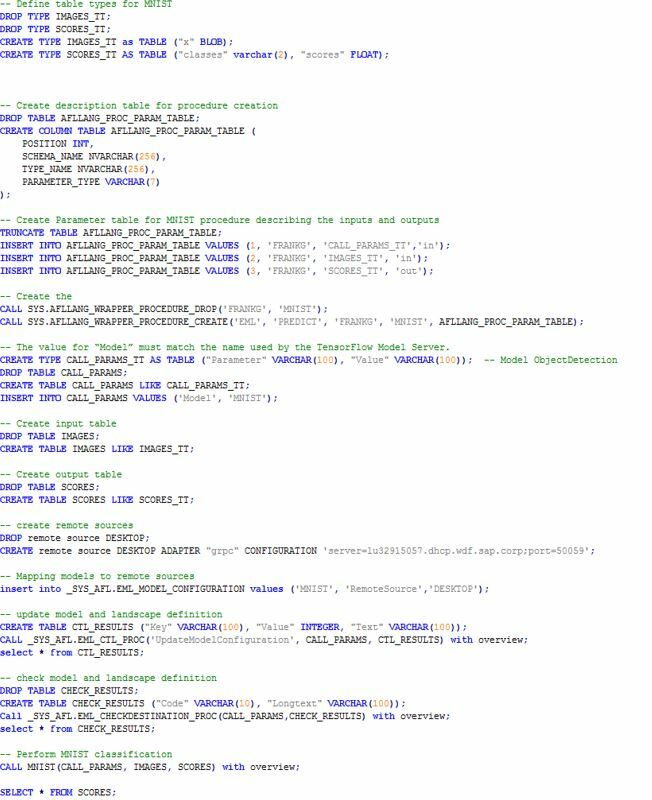 In this blog post, we want to show how you can do this using the External Machine Learning (EML) component of the Application Function Library (AFL) just released with HANA2 SPS02 (for general highlights see this blog). The new EML-AFL allows to execute inference call requests from SAP HANA SQL and SQLScript against a Google Tensorflow Serving instance and the available models. The data to be processed can either be passed from SAP HANA to TensorFlow or a location link to where the data is to be found can be passed along with the call. There is an excellent series of videos showing how to implement the MNIST classification problem on HANA, storing the images of as a 784-column table of floats. There’s nothing technically wrong with it, however the formatting of the MNIST data is unnecessarily awkward, because the video tutorial authors tried to change as little of the original model coding as possible. We would like to show an alternative approach using Googles recommended data format for TensorFlow called TFRecords. If you are not familiar with it yet, don’t worry, we’ll explain what you need to know about it. You need the mnist_saved_model.py to perform training and to save the model in a special format (saved_model) which can later be deployed on the TensorFlow Serving Server. This python script is part of the MNIST tutorial on https://tensorflow.github.io/serving/serving_basic.html. We show how to read the signature of the model using a command line tool provided by Google. In the second section, we explain what TFRecords are, how we can use them and how to get the data (the MNIST hand written images) into a HANA table. When a server is running, listening for inference requests and the images are stored in a HANA table, then you are ready to perform the actual inference call. This will feed the data into the TensorFlow graph and you can review the results in a HANA table. We show how this is being done. What does it tell me? It shows that the model contains two signatures. The first one is called ‘predict_images’ and expects a (raw) tensor of shape (-1,784), the -1 refers to an unspecified number of rows, and it returns a tensor ‘scores’ containing the results of the classification with shape (-1,10). 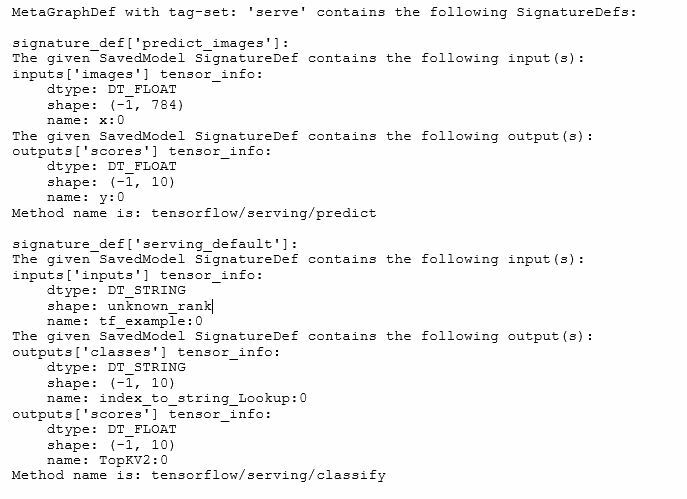 The second signature is called ‘serving_default’ and the input is a tensor ‘inputs’ with unknown_rank named tf.example. 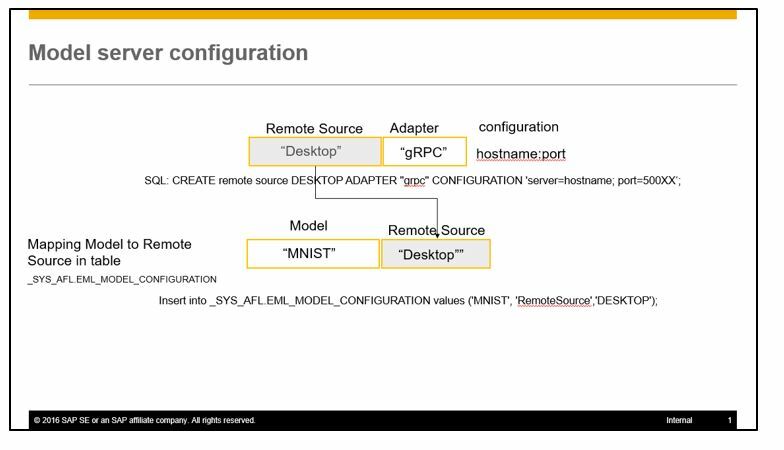 The outputs are ‘classes’ and ‘scores’ with the specified shapes and data types. So far everything looks good. Now the question is, how can I feed data to the graph using the ‘serving_default’ signature? This will be explained in the next section. TensorFlow’s file formats are based on Protocol Buffers also called protobuf, which generates classes for the various programming languages to handle the data in an efficient way. Storing records in that format makes up a .tfrecords file. Now let’s use this in practice. The following code snipped loads the MNIST data sets, converts them into a tf.example and saves the result in a file. This creates a tf.example of the following form with 784 values for the pixels of the 28×28 images. The next step is store the serialized data in a HANA table. Since we are dealing with binary data a natural way to store the data will be a BLOB (binary large object). To move the data from our python environment to the HANA world, the python connector pyhdb comes in pretty handy. We just open a connection and write the data (in this case for a single record) into a previously created HANA table, with one column defined as BLOB. 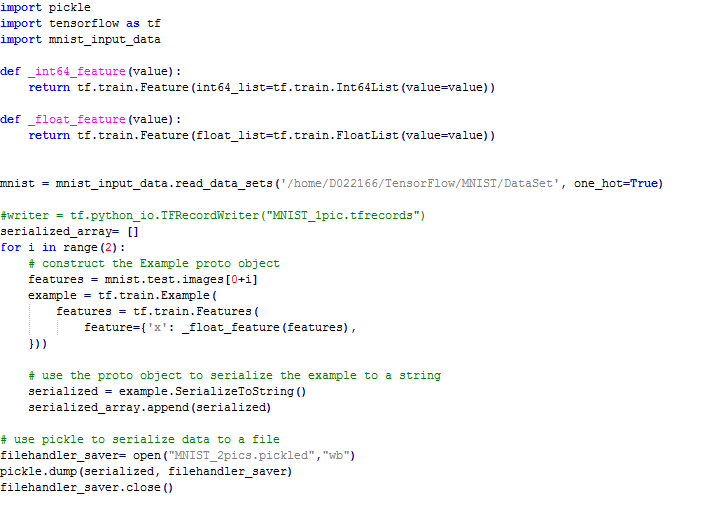 To recap, we now know what the standard format for feeding data into a TensorFlow graph is and how to converted the MNIST dataset (well at least some records of it) into this format. We saved the data to a file and tested our model using the command line interface by feeding the records into the serving_default signature and received the expected output. Finally, we stored the data in a HANA table as a BLOB and now we should be ready to perform inference calls. For the following script to work you need to have the AFL-EML installed on your HANA instance and you need a TensorFlow Serving Server (version 0.5.1 or higher). Details on the installation are described here ( https://tensorflow.github.io/serving/setup). If you want to save yourself the trouble of building TensorFlow serving from scratch, RPMs of TensorFlow model servers for SLES12 (OpenSUSE or Fedora should also work) can be found here. Now, we have assembled all the bits and pieces to perform the MNIST classification call. 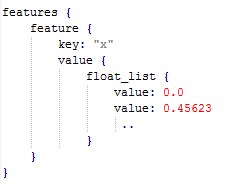 The input data (our tf.example records) are stored as a BLOB in table ‘IMAGES’. 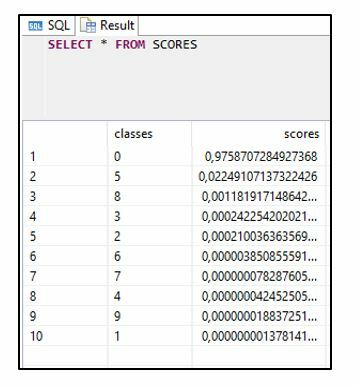 The output will be stored in table ‘SCORES’ containing the classes and the scores. The complete SQL script code is shown here. So finally, we got our classification results!! We could show that the image number 10 from the mnist.test.images data set which looks like this is indeed with 98% confidence the digit 0. This concludes the MNIST example and it illustrates the concepts which should be applicable to a much broader range of applications. The only prerequisite is, that you can train a TensorFlow model for your problem and that you can save it in the saved_model format. This enables you to deploy it to a TensorFlow Serving server. Datasets converted to tf.Example format and stored as a BLOB in a HANA table could then be used to query the model for inference calls. The results are written into HANA tables and are available for further processing. Alternatively, you could store images in a separate directory and store a reference like image ID in HANA, then pass the ID to the TensorFlow graph which will then load the specified image for further processing. This opens the door to many interesting use cases which we will explore in subsequent blog posts. Stay tuned ….. The way TFRecords have been prepared, slightly confusing. The TensorFlow model server installation on HANA part. However it’s a great info from your side.